What Are North Korea's Military Capabilities? North Korea has embarked on an accelerated buildup of weapons of mass destruction and modernization of its already large conventional force. The United States and its Asian allies regard North Korea as a grave security threat. It has one of the world’s largest conventional military forces, which, combined with its missile and nuclear tests and aggressive rhetoric, has aroused concern worldwide. But world powers have been ineffective in slowing its path to acquire nuclear weapons. While it remains among the poorest countries in the world, North Korea spends nearly a quarter of its gross domestic product (GDP) on its military, according to U.S. State Department estimates. Its brinkmanship will continue to test regional and international partnerships aimed at preserving stability and security. The planning of a historic U.S.-North Korea summit in June 2018 has opened the door for direct diplomacy, but many experts say the dismantling of North Korea’s arsenal would be a lengthy, challenging process. What are North Korea’s nuclear capabilities? North Korea has tested a series of different missiles, including short-, medium-, intermediate-, and intercontinental- range, and submarine-launched ballistic missiles. Estimates of the country’s nuclear stockpile vary: some experts believe Pyongyang has between fifteen and twenty nuclear weapons, while U.S. intelligence believes the number to be between thirty and sixty bombs. The regime successfully tested intercontinental ballistic missiles (ICBM), each capable of carrying a large nuclear warhead, in July and November 2017. Pyongyang said that in its November testing of the new Hwasong-15 ICBM, the missile hit an altitude of 4,475 kilometers (2,780 miles), far above the International Space Station, and flew about 1,000 kilometers (590 miles) before landing in the sea off Japan’s coast. Analysts estimate the Hwasong-15 has a potential range of 13,000 kilometers (8,100 miles) and, if fired on a flatter trajectory, could reach anywhere on the U.S. mainland. 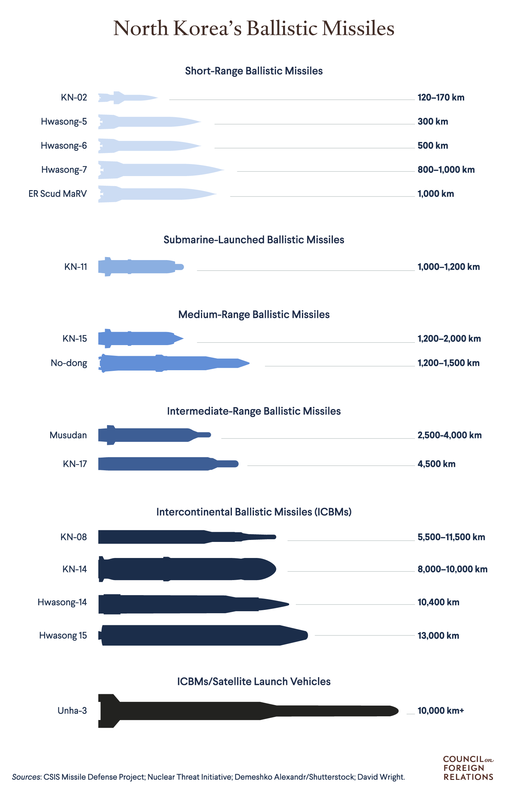 American analysts and experts from other countries still debate the nuclear payload that the ICBM could carry, and it is still unclear whether the ICBMs have the capability to survive reentry. A confidential U.S. intelligence assessment from July 2017 reportedly concluded that North Korea has developed the technology to miniaturize a nuclear warhead to fit its ballistic missiles. And some experts caution that it is only a matter of time before North Korea completes its nuclear force. “We’re going to have to learn to live with North Korea’s ability to target the United States with nuclear weapons,” said Jeffrey Lewis of the Middlebury Institute of Strategic Studies. North Korea has conducted six nuclear tests, first in October 2006 and then in May 2009 under Kim Jong-il. Under Kim Jong-un’s leadership the country detonated weapons in February 2013, January and September 2016, and September 2017. The regime possesses the know-how to produce bombs with weapons-grade uranium or plutonium, the primary elements required for making fissile material—the core component of nuclear weapons. We’re going to have to learn to live with North Korea’s ability to target the United States with nuclear weapons. The test carried out on September 3, 2017, was significantly larger, experts say, and could indicate that the country has developed much more powerful bomb-making technology. Initial estimates from seismic activity led observers to conclude that the explosion may have exceeded one hundred kilotons. An explosion of such a size gives credence to the North’s claims of having developed a hydrogen bomb. In April 2018, Chinese scientists reported that part of North Korea’s Punggye-ri underground nuclear test site had collapsed because of the strength of its latest blast. The following month, North Korea demolished tunnels at its testing site and invited around twenty foreign journalists to observe the explosions, a move seen as a confidence-building effort amid diplomacy between the United States and North Korea. As the power of the North’s nuclear tests intensified, so too did the pace of both the country’s nuclear and missile tests. Under Kim Jong-un, who assumed leadership of North Korea in late 2011, the nuclear program markedly accelerated. In addition to four tests under his regime, the country carried out more than eighty missile tests, far exceeding the trials of his father and grandfather before him. There remain significant unknowns surrounding the accuracy of North Korea’s ballistic missiles. Expert observers have said that these missiles are usually inaccurate because of their reliance on early guidance systems acquired from the Soviet Union. However, some defectors and experts say North Korea has begun using GPS guidance, similar to that of China’s navigation system, raising questions about the provenance of the system and whether North Korea’s arsenal of missiles is more accurate and reliable than previously believed. Have other countries aided North Korea’s nuclear program? The program is predominantly indigenous but has received external assistance over the years. Pyongyang received Moscow’s help from the late 1950s to the 1980s: it helped build a nuclear research reactor, provided missile designs, light-water reactors, and some nuclear fuel. In the 1970s, China and North Korea cooperated on defense, including the development [PDF] and production of ballistic missiles. North Korean scientists also benefited from academic exchanges with Soviet and Chinese counterparts. Though the exchanges may not have been explicitly tied to weapons development, the information learned from research sharing and visits to nuclear facilities can be applied to a militarized nuclear program, according to Joseph S. Bermudez Jr., an analyst of North Korean defense and intelligence affairs. Kim Jong-un believes that nuclear weapons are his guarantee of regime survival. Pakistan emerged as an important military collaborator with North Korea in the 1970s. Bilateral nuclear assistance began when scientists from the two countries were both in Iran working on ballistic missiles during the Iran-Iraq War (1980–1988). In the 1990s, North Korea acquired access to Pakistani centrifuge technology and designs from scientist Abdul Qadeer Khan, who had directed the militarization of Pakistan’s nuclear program. Pyongyang also received designs for a uranium warhead that Pakistan had likely obtained from China. In exchange, Pakistan received North Korean missile technology. It remains unclear whether Khan acted directly or indirectly on the behalf of the Pakistani government. (Khan’s multinational network also illicitly sold nuclear technology and material to buyers, including Iran and Libya.) The nuclear know-how gained from Pakistan likely enabled North Korea to pursue a uranium route to the bomb and operate centrifuges. Third parties have also facilitated Pyongyang’s program through the illicit shipment of metal components needed for centrifuge construction and nuclear weaponization. 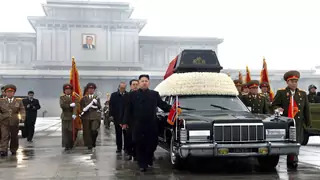 North Korea has developed covert networks for the procurement of technology, materials, and designs to boost its conventional and nuclear weapons programs since the 1960s. Over time, North Korea’s networks have shifted from being concentrated in Europe to Asia and Africa, and goods have often been traded multiple times before reaching North Korean hands, says Bermudez. What punitive steps has North Korea faced? North Korea’s withdrawal from the Nuclear Nonproliferation Treaty (NPT) in 2003 and its missile tests and first nuclear test in 2006 prompted the UN Security Council to unanimously adopt resolutions condemning North Korea’s actions and imposing sanctions against the country. The Security Council has steadily ratcheted up sanctions through subsequent resolutions in the hopes of changing Pyongyang’s behavior. These additional measures ban the sale of materials and technology that would bolster North Korea’s ballistic missile and nuclear weapons programs, financial assistance to these programs, and arms sales; they also impose restrictions on select luxury goods and other foreign trade, and force the inspections of cargo bound for North Korea. Though sanctions have curtailed North Korea’s access to materials, it is difficult to enforce and regulate all international cargo deliveries. More recently, there has been a greater push to limit North Korean financial resources in a bid to stunt funds directed to military and nuclear advancements. Some experts and officials have condemned China’s earlier assistance to the North’s ballistic missile program, ongoing trade relationship with North Korea, and lackluster enforcement of sanctions. Separately, North Korea has a record of missile sales and nuclear technology sharing with countries like Iran, Libya, Syria, Egypt, Vietnam, Yemen, United Arab Emirates, and Myanmar. 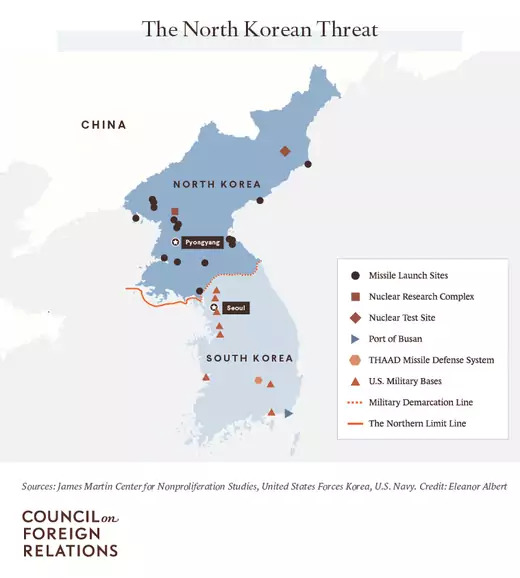 It has secretly transferred “nuclear-related and ballistic-missile-related equipment, know-how, and technology.” Given North Korea’s economic constraints, fears abound that more nuclear material and knowledge could be sold, enhancing the potential for nuclear terrorism. Does North Korea possess other weapons of mass destruction? The North is believed to have an arsenal of chemical weapons, including sulfur mustard, chlorine, phosgene, sarin, and VX nerve agents. The regime reportedly has the “capacity to produce [PDF] nerve, blister, blood, and choking agents” and is estimated to have stockpiled [PDF] between 2,500 to 5,000 tons of chemical weapons. Its chemical toxins can be fired using a range of conventional shells, rockets, and missiles. The Korean People’s Army undergoes training to prepare for potential combat in a contaminated environment. North Korea is reported to have received early help from the Soviet Union and China to develop its chemical weapons program. North Korea is also believed to possess some biological weapons capabilities, although it became party in 1987 to the Biological Weapons Convention, a treaty banning the production, development, stockpiling, and attempts to acquire biological weapons. In 1988, it acceded to the Geneva Protocol, which prohibits the use of asphyxiating, poisonous, and other gases in warfare. The North allegedly has the ability to produce [PDF] pathogens such as anthrax and smallpox, though it is unclear if these bacteria can be deployed in combat. What are North Korea’s conventional military capabilities? The country has carried out more than eighty missile tests, far exceeding the trials of [Kim’s] father and grandfather. North Korea has deployed munitions near and along its border with the South and also has conventional missiles aimed at its neighbor and Japan in a bid to deter potential attacks. According to a 2015 U.S. Department of Defense report [PDF] and a 2016 South Korean Ministry of National Defense report [PDF], the North Korean military has more than 1,300 aircraft, nearly 300 helicopters, 430 combatant vessels, 250 amphibious vessels, 70 submarines, 4,300 tanks, 2,500 armored vehicles, and 5,500 multiple-rocket launchers. Experts also estimate that North Korea has upwards of one thousand missiles of varying ranges. Does it pose a cybersecurity threat? North Korea has developed computer science know-how and cyberattack capabilities, likely boosted by Chinese and Soviet assistance in the 1980s and 1990s. The majority of North Korea’s earlier cyberattacks have been distributed denial of service (DDoS), attempts to disrupt a website by flooding it with traffic from multiple sources, and web-defacing in nature, indicating that its cyber operations were still not that sophisticated. Much of the North’s cyber activities take advantage of using infrastructure outside of the country, particularly China’s infrastructure and, to a certain extent, nodes in third countries like Malaysia, boosting the regime’s deniability and ability to avoid retribution for attacks. In recent years, responsibility for cyberattacks on South Korean banks and media outlets as well as the 2014 Sony Pictures hack was attributed to groups with ties to North Korea. There is mounting evidence that North Korea was also involved in the February 2016 cyber theft of $81 million from the Bangladeshi central bank account at the Federal Reserve in New York, the first instance of a state actor being identified for using cyber operations to steal money. The North’s operations grow bolder still: researchers have linked North Korea to an increasing number of cyber incidents on financial institutions and South Korea said the North had breached its military cyber command in December 2016. A Center for Strategic and International Studies report stated “North Korea seems heavily invested in growing and developing its cyber capabilities for both political and military purposes.” Pyongyang and government-linked cyber entities view cyberattacks as a means of seeking financial gain, acting as a deterrent against adversaries in the event of military conflict, and fulfilling the country’s desire of being portrayed as a capable and dangerous actor, says Adam Segal, director of CFR’s Digital and Cyberspace Policy Program. What drives North Korea’s militarization? North Korea’s guiding philosophical principles have been juche (self-reliance) and songun (military-first politics). The military plays a central role in political affairs and its position has been steadily elevated through the Kim dynasty. North Korean leadership believes that hostile external forces could mount an attack, including its democratic neighbor to the south and the United States. As a result, in Pyongyang’s eyes, the only way to guarantee its national survival is to develop asymmetric military capabilities to thwart its perceived threats. In the decades since the Korean War armistice, the regime in Pyongyang has grown increasingly isolated, in large part due to its ongoing nuclear pursuits and other military provocations. The North’s economy and impoverished population of twenty-five million are more and more cut off from the global economy, with limited means to acquire much-needed hard currency. Despite Pyongyang’s reputation as a pariah state, Kim Jong-un has embraced a national strategy to jointly build up the economy and its nuclear forces. Kim has struggled to deliver on his economic promises. Demonstrating unquestioned military might, particularly of the nuclear variety, is the means by which the young leader seeks to consolidate his rule and portray himself as powerful. The nuclear program has a dual purpose: to deter external threats but also to bolster the strength and image of Kim. “Kim Jong-un believes that nuclear weapons are his guarantee of regime survival,” says Bruce Bennett, a senior researcher at RAND Corporation, a California-based think tank. Since Kim Jong-un assumed power, the country has shed the ambiguous language surrounding its nuclear and missile development, instead vowing to conduct tests whenever it sees fit. Punitive measures taken against Pyongyang seem to have emboldened Kim Jong-un’s commitment to strengthening his military. While a flurry of diplomatic efforts toward denuclearization surged in the spring of 2018, how a peace process might proceed remained uncertain. Melissa Hanham, of the James Martin Center for Nonproliferation Studies at the Middlebury Institute, explains the technical and legal complexities of North Korean denuclearization in a May 2018 CFR interview. Victor Cha and Mike Mullen discussed the status of U.S.-North Korea relations, nuclear security, and nonproliferation at an April 2018 CFR meeting. Joseph S. Bermudez Jr. investigates the infrastructure of North Korea’s nuclear, biological, and chemical programs in this June 2017 report [PDF]. The New York Times provides a brief timeline of the nuclear weapons program in the United States. The James Martin Center for Nonproliferation Studies produced an interactive database to track North Korea’s missile launch tests. Bruce Klingner and Joseph Bosco discussed [PDF] North Korea’s nuclear weapons and ballistic missile program at the Air Force Association in May 2017. This December 2015 Center for Strategic and International Studies report investigates North Korea’s cyber operations.